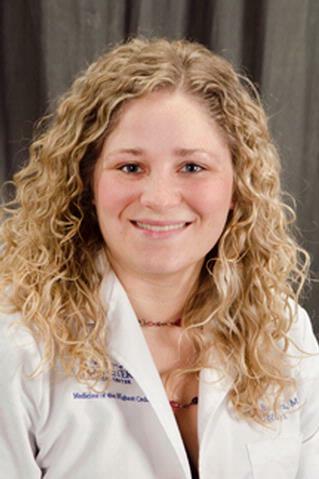 Dr. Kristen Burhans is a graduate of the University at Buffalo School of Medicine and Biomedical Sciences. She completed her residency in Obstetrics and Gynecology here at the Univeristy of Rochester. As a general gynecologist she enjoys providing gynecologic care from adolescence through menopausal care - from general preventative care, to management of gynecologic problems such as PCOS, fibroids, painful periods or abnormal uterine bleeding. She has a special interest in minimally invasive surgerical approaches such as operative hysteroscopy and laparoscopic hysterectomy. She was recognized during her residency for her excellent laparoscopic surgical skills with the Society of Laparoscopic Surgeon's Resident Achievement Award in 2015. She also enjoys taking care of patients with complex obstetric needs; she cares for pregnant women during their prenatal care, as well as for their inpatient deliveries and postpartum care. She was awarded the Obstetric Perinatology Award and the Resident Award for Excellence in Obstetrics in 2015. She strives to educate women of all ages about reproductive health, contraceptive options and empowers women to take charge of their health care. She has a special interest in educating medical students and residents and training the next generation of obstetricians and gynecologists. She has been recognized for her abilities as a teacher and as a leader amongst her peers with the Dr. Ward L Ekas, the Dr. Richard E Fullerton and Obstetrics & Gynecology Department Awards. She is also the Director for OB/GYN Simulation Curriculum - organizing simulation sessions for residents to practice important skills, manage uncommon obstetric emergencies and demonstrate competency in a variety of obstetric & gynecologic skills. My research interests include medical student, resident and interprofessional education, specifically integration of experiential learning and simulation into formal curriculum.